1.Small Caps Lag in Feb….Tax Cuts Delayed Until Late Summer. 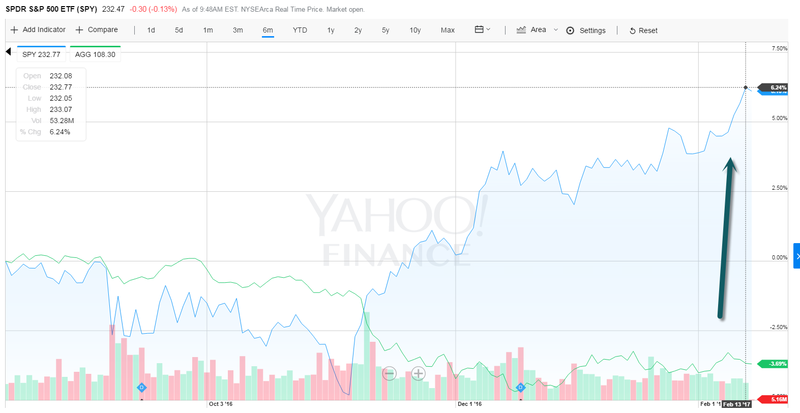 S&P vs. IWM (Small Cap Index) Feb.
2.Glencore—Another Commodities Name Up From the Ashes….+76% Since Ja. 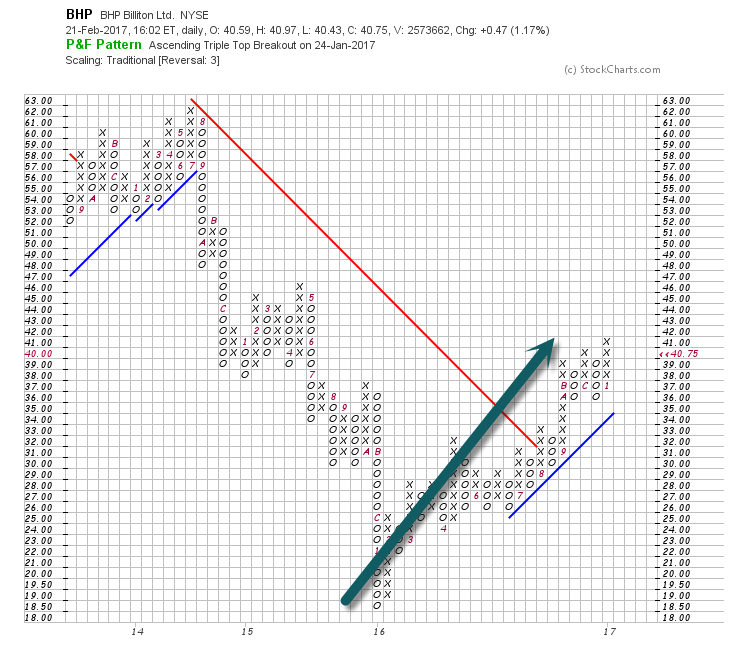 2016 Pullback. 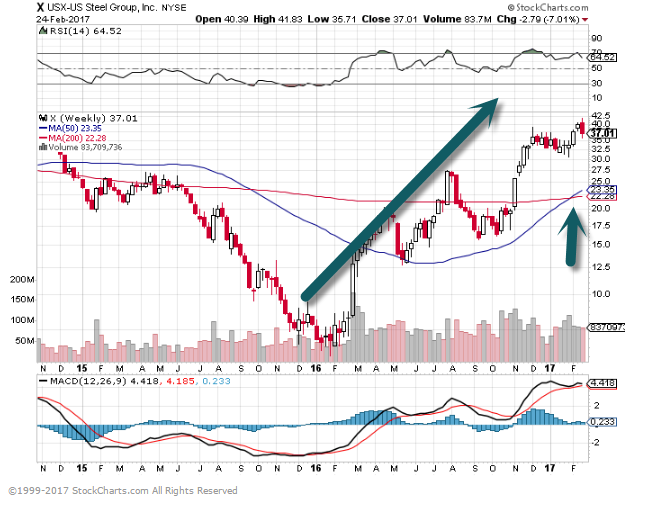 U.S. Steel +530% Off Bottom…50day thru 200day to Upside on Weekly Chart. 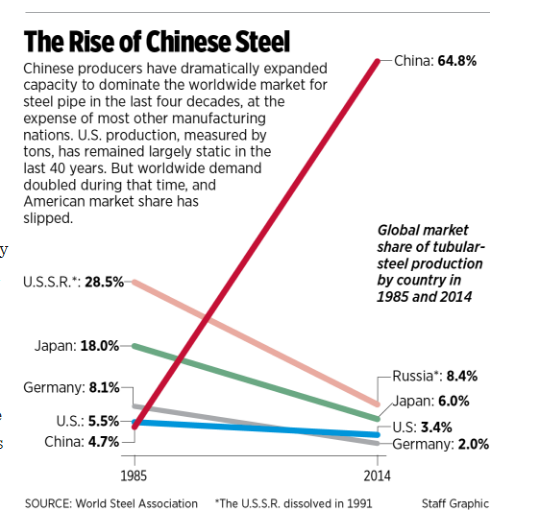 4.The Rise of Chinese Steel and Collapse of Price. 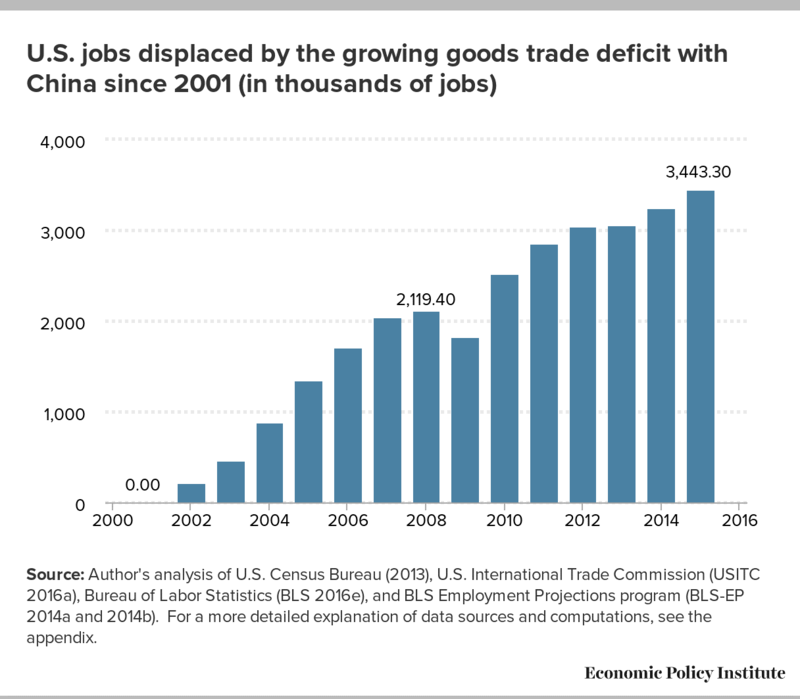 5.That’s a Ton of Displaced Jobs in 15 Years….Populism? 23 Million People Remain Outside Confines of Labor Force-David Rosenberg. 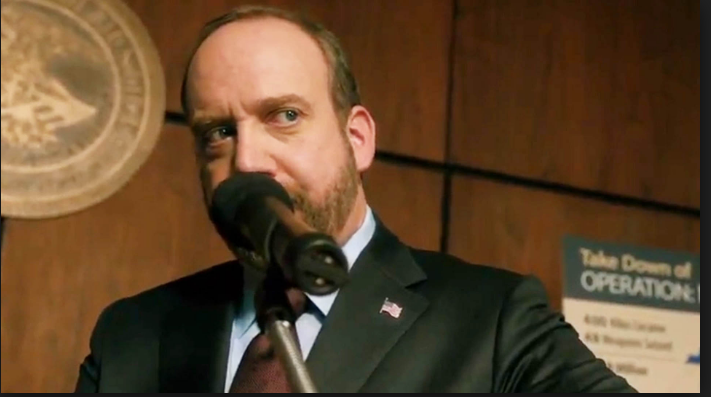 How would you advise President Trump? We have 23½ million Americans age 25 to 54 who reside outside the confines of the labor force. It is not that they’re unemployed. They by definition have disengaged from the entire economy, and that number has never been that high. The irony is that we have a record level of job openings. There is a skills mismatch. So we need a WPA-type program, except with education? Yes—education, training, skills development, apprenticeship programs. We have to find a way to retool these disenfranchised prime working age folks. Enrollment in universities and colleges is going down, and we do not have nearly enough engineers, scientists, and mathematicians. The No. 1 priority should be redressing the single biggest constraint on the economy outside of the fact that we have excessive debt loads. The two would benefit more than other developing economies if the U.S. and China spend heavily on infrastructure projects. As commodity prices stabilize, two developing countries should be winners: Russia and Indonesia. Among major emerging markets, commodities as a percentage of exports are greatest in Russia, at roughly 70%, followed by Brazil (51%), India (35%), and Indonesia (35%), according to World Trade Organization data provided by Pavilion Global Markets. But India imports half of its commodities and food needs, and the rise in oil prices may weigh on its economy, as will the lingering negative of last fall’s rupee demonetization. And Brazil is still struggling with high interest rates and debt, as it recovers from a deep recession. But stronger commodity prices should benefit Russia and Indonesia. Driving demand are two factors: The first is China, which could spend close to $800 billion over the next three years on transportation improvements alone. The second is the U.S,, which also is likely to undertake infrastructure projects that will drive commodity consumption. Exports from emerging markets have risen over the past six months, helping to boost foreign currency reserves in half of them, says François Boutin-Dufresne, a global strategist at Pavilion, an independent research and brokerage firm in Montreal. He’s bullish on buying the MSCI Emerging Markets Index over the next three to six months. 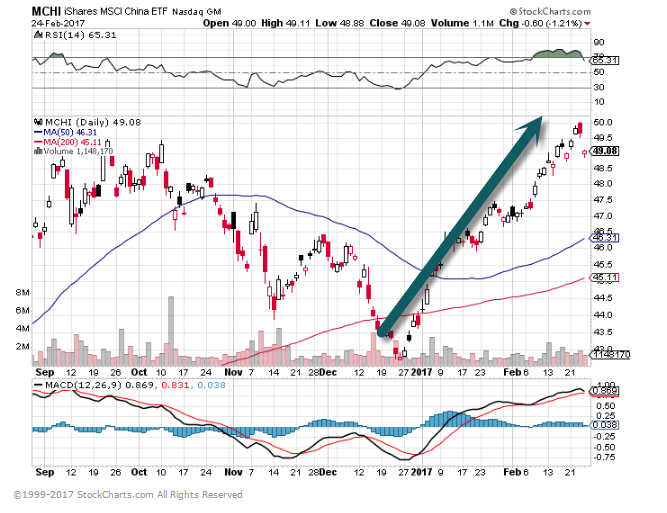 The iShares MSCI Emerging Markets exchange-traded fund (ticker: EEM) is up 11% this year. 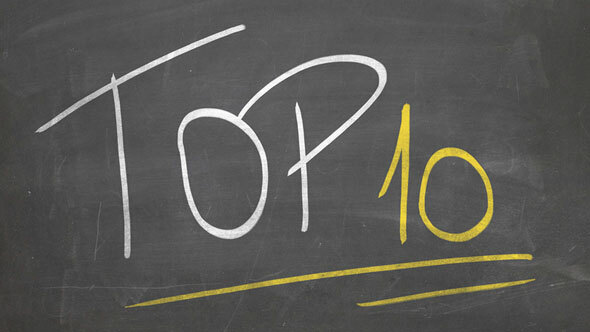 When it comes to rankings, a “ten” is typically considered as good as it gets. In many sports, a “ten” is considered the best possible score. In 1976, Nadia Comaneci was the first gymnast to ever score a perfect ten when she was flawless on the uneven bars. Then, in 1979, Bo Derek also taught us that a ten was perfect. This week, the DJIA was more than perfect, and like the amps from Spinal Tap, it pulled an eleven. And it did so in dramatic fashion, as the only time that the DJIA traded in positive territory was in the final seconds of the trading day. So where do we go from here? Along with the DJIA this week, all of the major averages hit new bull market and all-time highs, as one of the most unloved bull markets of all time continues to chug along. For the S&P 500, the current bull ranks as the second longest and third strongest of all time. While it will be some time before the current bull makes a run for the top spot in either category, in strength terms, a gain of 5% from here will put the current bull into second all-time as well. 9.Read of the Day…FED Watching VIX. 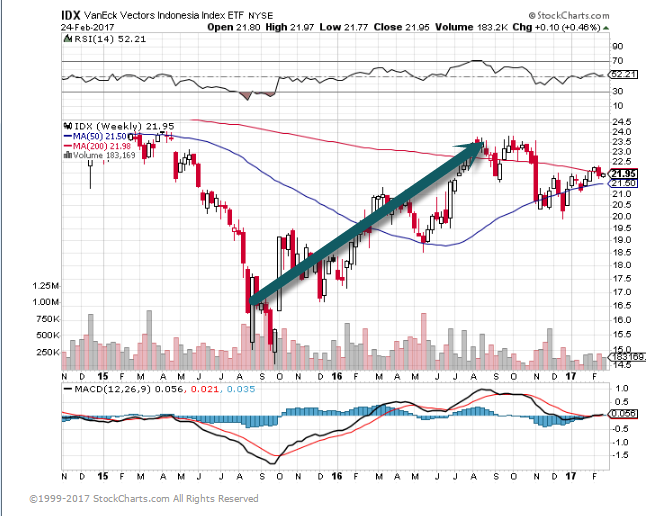 After reading Alan Greenspan’s book, I was shocked how much the FED monitored the financial press, but I am even more surprised that they are watching the VIX. The Federal Reserve is worried that the stock market might be showing signs of complacency. The central bank’s most recent communication — the Fed minutes for the January/February meeting — released on January 22 shows that members are split on whether President Trump’s agenda will spur economic growth. That uncertainty doesn’t seem to be showing up in the stock market, however. 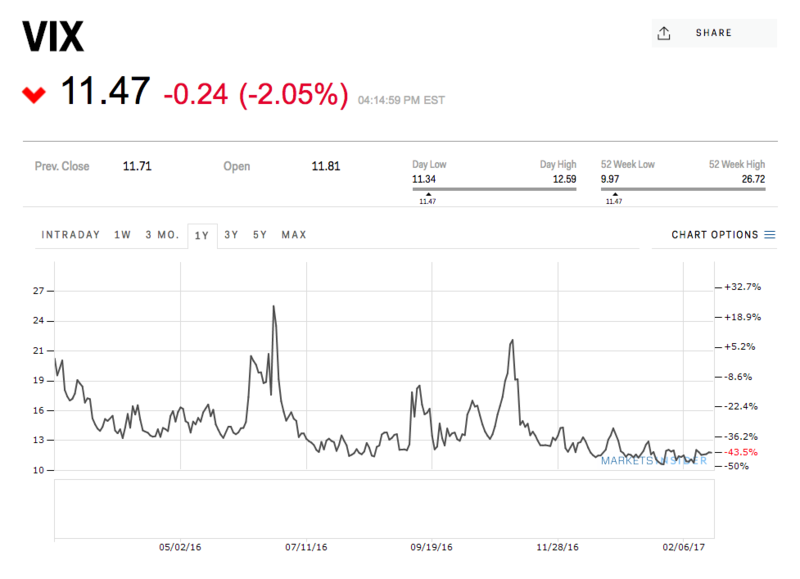 The Chicago Board Options Exchange volatility index, which gauges investor anxiety (technically, implied expectations for volatility in the stock market) and is widely known as the VIX index, has been trending down. What is implied volatility, and why is it so low? The VIX is commonly read as a gauge of market fearfulness, and measures the market’s expectation of volatility implicit in the price of options on the Standard & Poor’s 500. One way to think of it is like the cost of an insurance policy. When the market is expected to be volatile, there are more buyers of insurance, and so the cost of that insurance rises. When the market is relaxed, nobody’s interested in buying insurance against a wild swing, so the protection offered by options is inexpensive. 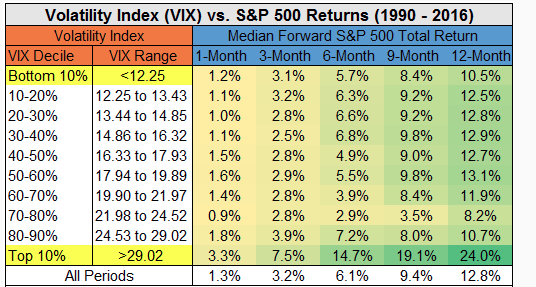 Lately, the VIX has barely been moving, only breaking 20 on a handful of occasions, and generally trending below 13. 10.Mark Cuban…Next Job Growth will be About Interpreting the Data. The billionaire investor predicts one crushing reality of automation. If Cuban’s prediction does indeed come true, with the need for coders, developers, and engineers eventually evaporating, what sort of workers will be in demand? Those who can make sense of the data that automation is spitting out. No, not data scientists. Cuban believes employers will soon be on the hunt for candidates who excel at creative and critical thinking. “I personally think there’s going to be a greater demand in 10 years for liberal arts majors than for programming majors and maybe even engineering,” Cuban said. He cited degrees such as English, philosophy, and foreign languages as being the most valuable. 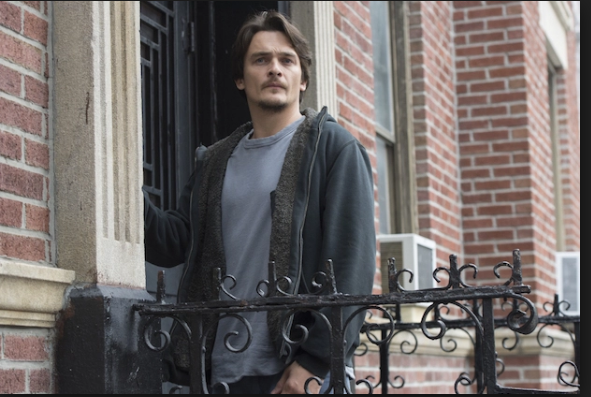 “Maybe not now,” Cuban acquiesced. “They’re gonna starve for awhile.” Their day, though, is likely coming, he says. 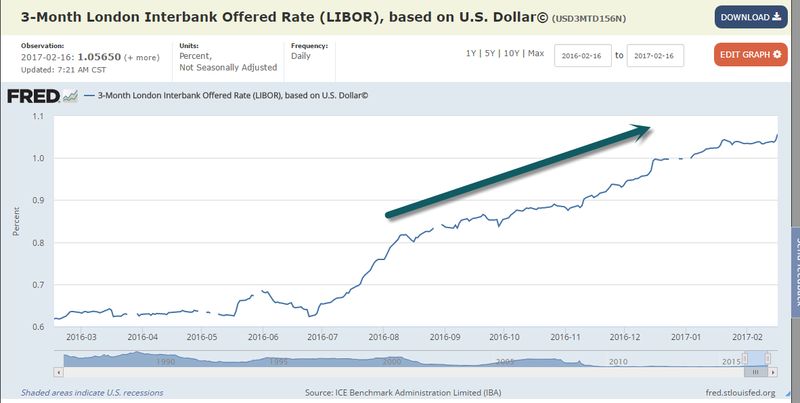 LIBOR (or ICE LIBOR) is the world’s most widely-used benchmark for short-term interest rates. It serves as the primary indicator for the average rate at which banks that contribute to the determination of LIBOR may obtain short-term loans in the London interbank market. Currently there are 11 to 18 contributor banks for five major currencies (US$, EUR, GBP, JPY, CHF), giving rates for seven different maturities. A total of 35 rates are posted every business day (number of currencies x number of different maturities) with the 3-month U.S. dollar rate being the most common one (usually referred to as the “current LIBOR rate”). The breakdown of nonfinancial debt referencing Libor is as follows: it amounts to just over $28 trillion, with trillions more added if one adds the financial Libor-referenced debt. (Bloomberg) — There’s safety in numbers. Until a stampede starts. 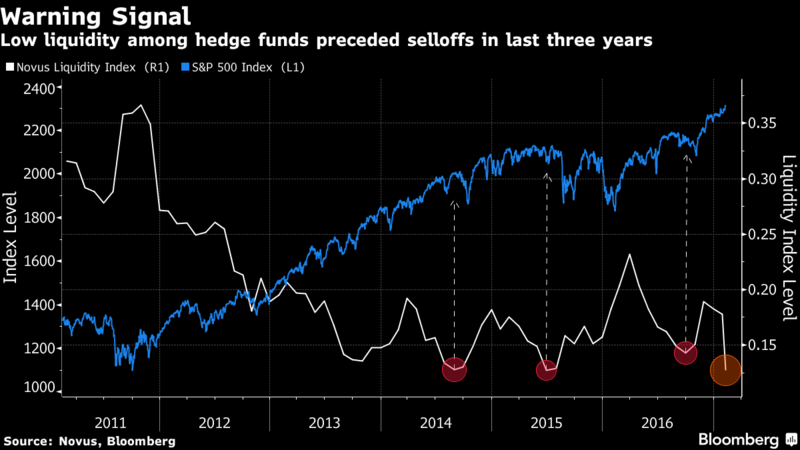 That’s the theory underlying a study of hedge fund holdings by Novus Partners Inc., which sought to calculate how easily the market could absorb concerted selling by large money managers. 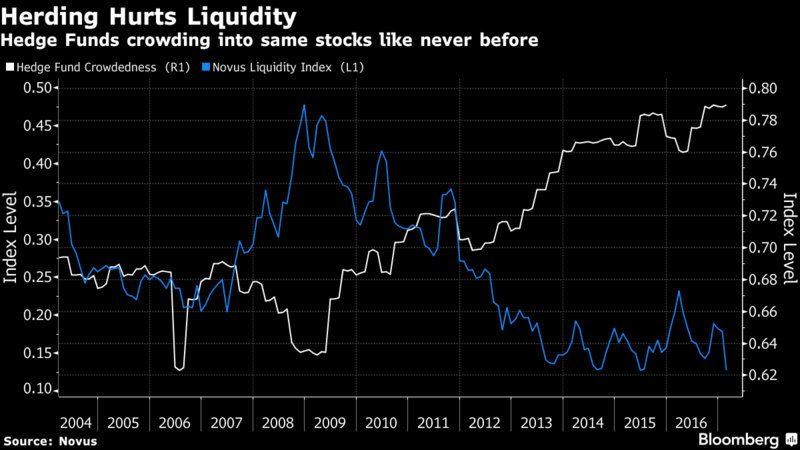 Using an analysis that turns mainly on how much volume is occurring in stocks favored by professional speculators, Novus says liquidity is at an all-time low. Hedge Funds in Crowded Trades. 2.U.S. Consumer Prices Recorded Biggest Increase in 4 Years. households paid more for gasoline and other goods, suggesting inflation pressures could be picking up. The Labor Department said on Wednesday its Consumer Price Index jumped 0.6 percent last month after gaining 0.3 percent in December. January’s increase in the CPI was the largest since February 2013. In the 12 months through January, the CPI increased 2.5 percent, the biggest year-on-year gain since March 2012. The CPI rose 2.1 percent in the year to December. Economists polled by Reuters had forecast the CPI rising 0.3 percent last month and advancing 2.4 percent from a year ago. Inflation is trending higher as prices for energy goods and other commodities rebound as global demand picks up. 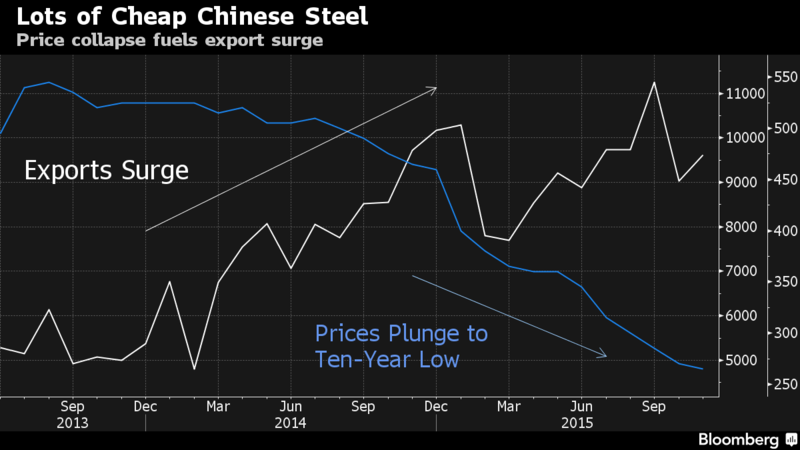 3.BHP +121% Off 2016 Lows…Commodities Tell? Global Growth Tell? From Dave Lutz at Jones. The big money in markets is often made by seeing what others don’t. It’s about resisting the gravitational pull of consensus, treading lightly where consensus is right, while spotting subtleties where the herd might be wrong. One subtlety we’ve been watching recently is volatility. Volatility, of course, is the measurement of the daily market fluctuations. In times of fear, the volatility of an asset rises. In times of buoyancy, all is well. The market simply floats higher and volatility falls. We have a nuanced view of volatility here at Hedgeye. 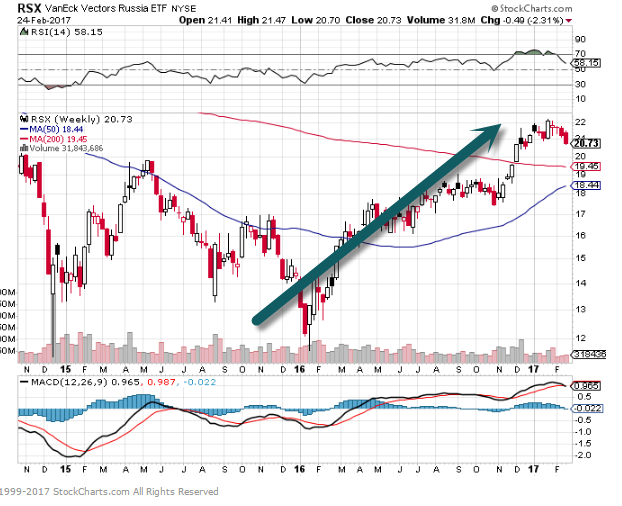 Conceptually, there are two types of volatility we’re looking at, realized volatility (i.e. the volatility of an asset historically) and implied volatility (i.e. investors’ expectations of future volatility that’s embedded in options markets). These volatility readings are painting a clear picture for investors today. As the stock market continues to make all-time highs, historical or realized volatility is falling to cycle lows. Meanwhile, fearful traders expect rising future volatility in the stock market and are buying downside protection in options markets to stave off the pain of an impending correction. The Chart of the Day below from today’s Early Look is a visual representation of precisely that. 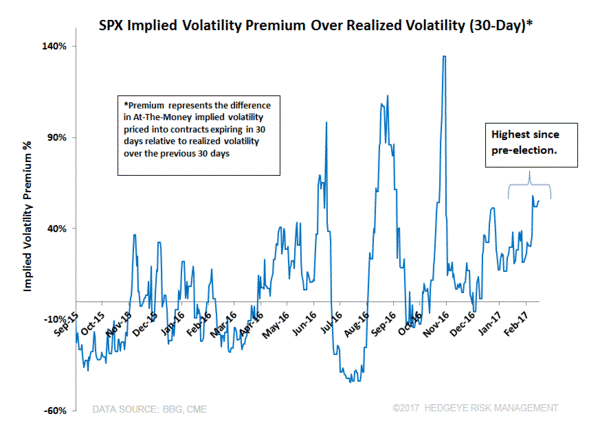 The S&P 500 implied volatility premium on a 30-day basis is 52.2%. That’s a fancy way of saying investors are fearful of downside risks as historical volatility continues to fall. Note: A premium this high in the stratosphere hasn’t been hit since before Election Day. Investors must put this volatility measure in the context of where we’re at in the economic cycle. Unsurprisingly, U.S. economic growth and inflation drive financial market returns. We believe both growth and inflation are accelerating. Retail sales and inflation reports last week were near or above 5-year highs. With this positive backdrop, we think equity markets can head higher from here. In other words, investors betting on significant future downside will get squeezed out of those positions. 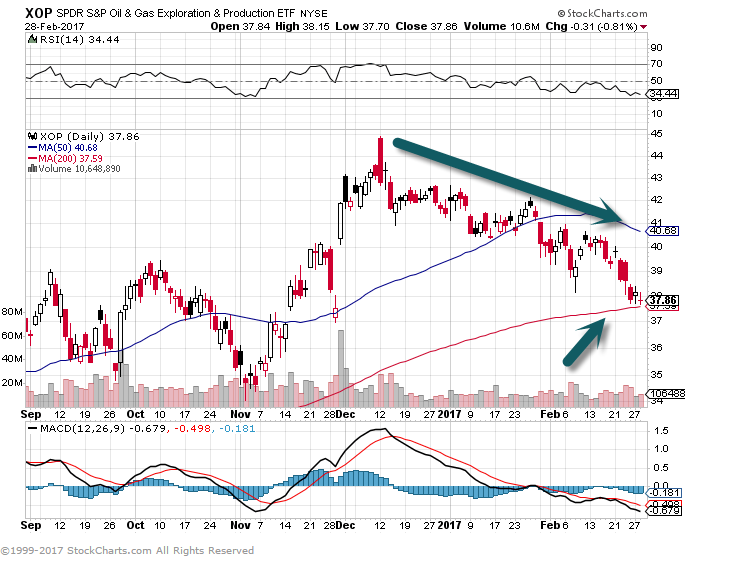 It might actually be more risky piling into sectors like Consumer Staples (XLP) and Utilities (XLU), which are typically equity exposures investors buy when future downside is expected. In these sectors, implied volatility premiums are infinitesimal, 0.3% for Consumer Staples and 4.8% for Utilities. Implied volatility premiums this low suggest investor complacency. 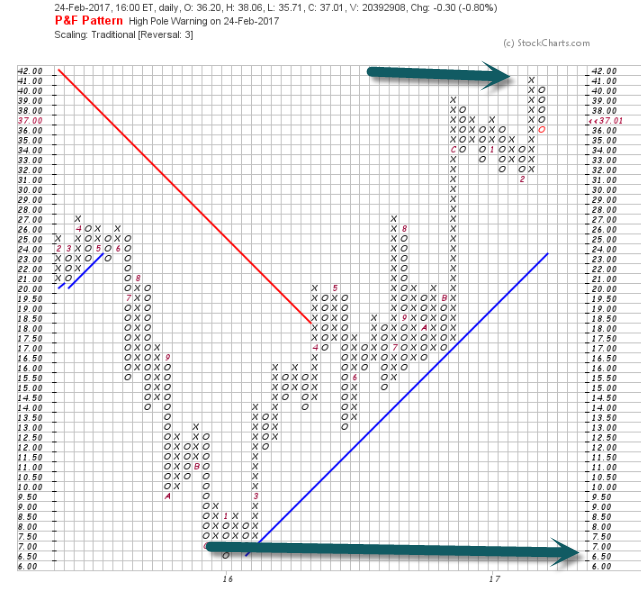 The prevailing market trends say stick with U.S. equities here. 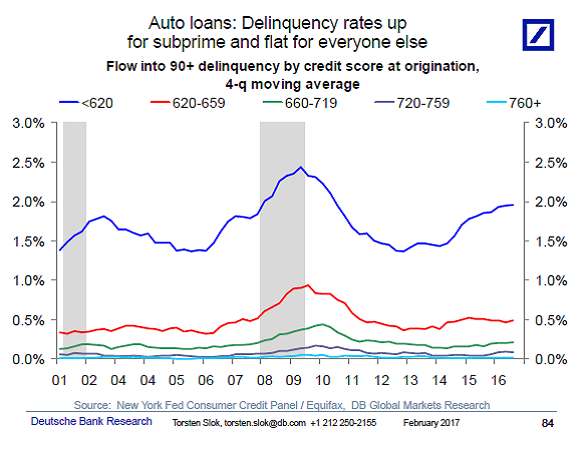 6.Auto Loan Delinquency Up But Not Big Enough to Move Macro Needle. I’m getting questions from clients asking if the recent increase in subprime auto loan delinquency rates is a problem. Delinquency rates for people with credit scores lower than 620 have moved higher but for households with credit scores above 620 delinquency rates are moving sideways, see the first chart below. 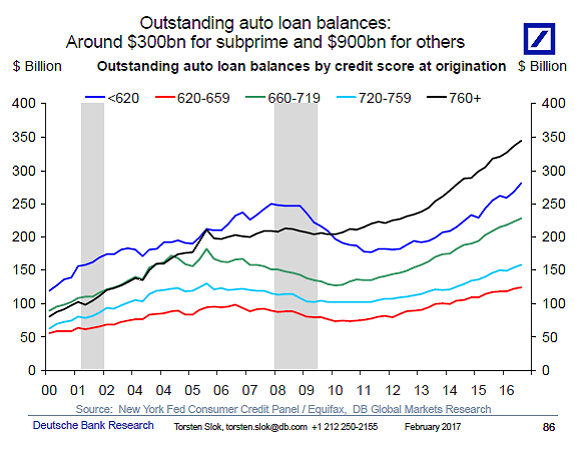 Also, while subprime auto loan origination has increased to 2006 levels we have seen an even bigger increase in origination and amount outstanding for prime borrowers, see the second and third chart. Finally, it is important to remember that total household net worth currently stands at $90 trillion, and in that perspective, total outstanding subprime auto loans at less than $300bn seems very small. The 2006 subprime mortgage market was much bigger than today’s subprime auto loan market, and there was much more leverage in the financial system in 2006 compared with today. The bottom line is that the increase in delinquency rates for subprime auto loans may be a worry for those holding the debt, but it is not a problem for the macro economy. 7.Rents Slowing Down…Banks Pulling Back on Apartment Lending. 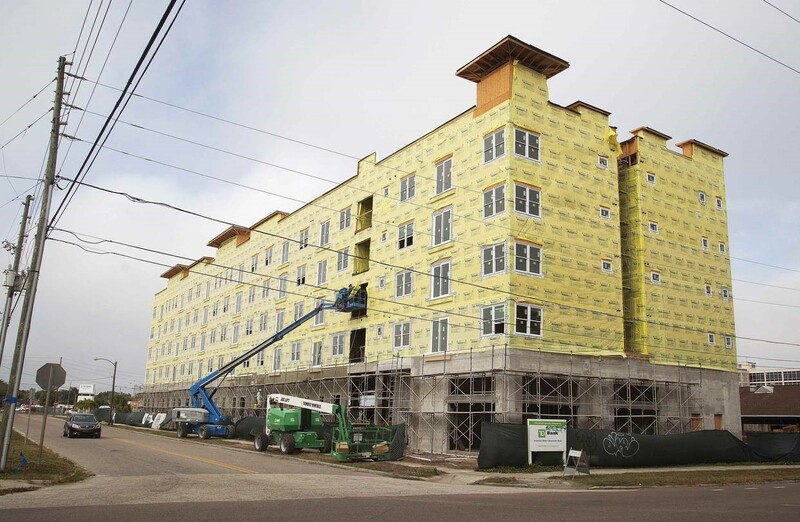 Now banks are in retreat, forcing developers to look to nontraditional lenders and seek more expensive types of financing to complete projects, said apartment executives, industry analysts, mortgage brokers and bankers. “We had fairly robust growth in our construction, real estate construction book, and that’s slowing now,” said P.W. Parker, chief risk officer of Minneapolis-based U.S. Bancorp, during an earnings call last month. “Multifamily is an area that, if you look at the forecasts, there are forecasts pretty broad-based of potential rent declines in a lot of the major cities. So we’re being more cautious there. 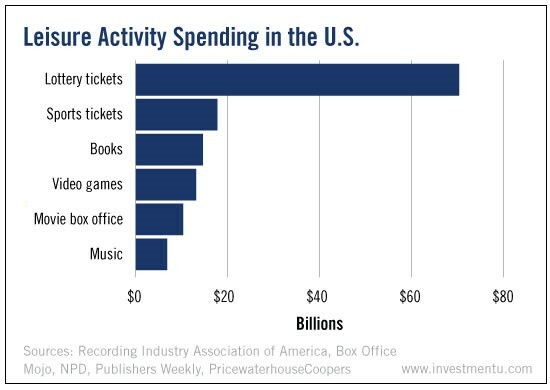 8.The amount Americans threw away on lottery tickets was $7.4 billion more than what was spent on all other forms of entertainment combined. In the last few weeks I attended several higher education conferences where the talk among campus officials in the hallways and in sessions was usually centered around the same topic: President Trump. What’s clear in these conversations is that the much-discussed education divide that separated the electorate last fall between those with a college degree and those without has not dissipated since the election. But the disdain academics exhibit for Trump these days ignores the role that their own colleges and universities played over the past two decades in fueling the working-class anger that led to his 2016 victory. The story begins in the 1990s, when a college degree became increasingly necessary for economic success. 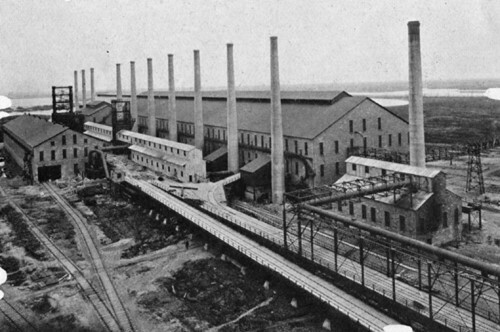 The manufacturing sector, with its middle-class jobs requiring only a high-school diploma, had mostly collapsed the previous decade. This shift in the economy coincided with a sea change in college admissions. The ease of travel and declining cost of communications meant that admissions was no longer a local game where even selective colleges with large endowments and strong brand names recruited mostly in surrounding states. When the U.S. News & World Report rankings became an annual publication in the late 1980s, colleges jockeyed to move up the rankings in order to gain prestige. To do that, they had to find better students outside their usual recruitment zone. And for schools a few rungs down the rankings ladder, it required luring top-notch students with boatloads of financial aid—even if their families didn’t need the money to send their kids to college. Access to higher education for students at all income levels, which had been prevailing policy since the signing of the Higher Education Act in 1965, was shoved aside. In the drive for prestige, selective colleges in particular became less economically diverse, full of wealthy students and a few smart kids lucky to get a Pell grant (which mostly go to students from families making less than $50,000 annually). In 2013-14, only 22 percent of students received Pell grants at top universities, compared to around 38 percent everywhere else. Students on Pell grants tend to be clustered at less-selective public and private colleges, and poor-performing for-profit colleges. This economic disparity is well known in higher education, but the extent of it became clear last month when researchers released the most comprehensive look to date at the financial background of students on college campuses. The results of the study—gleaned from analyzing the tax records of some 30 million students born between 1980 and 1991 and linked to nearly every college in the country—were startling. At 38 colleges, including five in the Ivy League, there are more students from families in the top 1 percent in income than the bottom 60 percent. What’s more, about 25 percent of the richest students attend a selective, elite college. By comparison, less than one-half of 1 percent of children from the bottom fifth of U.S. families by income attend an elite college. As the economic divide grew ever wider among students on campuses over the last two decades, countless students graduated from college without the benefit of ever really knowing classmates from working-class families. Some of them then came to Washington to work on Capitol Hill, in the White House and in federal agencies to develop policies that would impact people without a college degree. They had little idea what it was like to lack a credential that carried so much weight in the job market. Instead of being shocked by Trump’s win, higher education leaders should look internally at their own strategies that focused on gaining prestige and often exacerbated the growing economic divide by favoring students from wealthy and middle-class families. College leaders are beginning to take notice. In December, a handful of selective colleges and universities announced an effort to identify, recruit, and support highly qualified low-income students. The American Talent Initiative aims to boost the number of Pell grant recipients at the 270 colleges with the highest graduation rates by 50,000 within 10 years (an increase of more than 10 percent). This effort is a good start to reverse the trends of the last two decades, but it might be too little, too late. Higher education lost an entire generation of students who will become leaders in the future and missed out on an opportunity to have an undergraduate experience full of students from different economic backgrounds. Jeffrey Selingo is author of There Is Life After College: What Parents and Students Should Know About Navigating School to Prepare for the Jobs of Tomorrow. You can follow his writing here, on Twitter @jselingo, on Facebook, and sign up for free newsletters about the future of higher education at jeffselingo.com. He is a regular contributor to the Washington Post’s Grade Point blog, a professor of practice at Arizona State University, and a visiting scholar at Georgia Tech’s Center for 21st Century Universities. What could the sport of running teach us about the secrets of self-leadership and reaching our business finish lines? I’ve been a fan of Dean Karnazes ever since I read his book Ultramarathon Man several years ago, so I eagerly devoured his newest, The Road to Sparta, which tells the story of history’s first-ever marathon. Some of us know the popular version of the story, where after the Athenians defeated Persian invaders at the battle of Marathon 490 B.C., a messenger ran 26 miles to share the exciting news. But Karnazes shares the real story, where the runner, whose name was Pheidippides, actually ran more than 150 miles all the way from Athens to Sparta, then back again, before the battle. Why would a person willingly go through something like that? That observation doesn’t just apply to running. That applies to all of life, including leading our organizations. 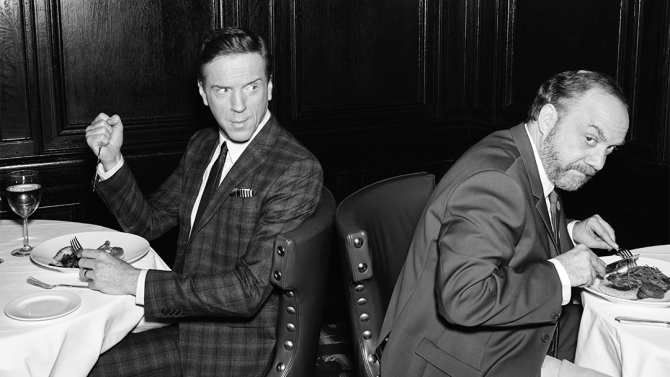 When it comes to work, comfort equals boredom. Engagement and even happiness come when we’re gunning toward major goals. I’m talking about the kind of achievements that push us outside our comfort zone. Maybe it’s launching a new product line, starting a new career, or growing a sales channel by double digits. If staring down the goal makes you feel uneasy, you’re on the right track. When Karnazes was a child, he went to a basketball camp coached by the legendary John Wooden. A small kid, Karnazes struggled to get rebounds like the bigger children. But Wooden could see his spirit and gave him some advice: “Do what you can.” Instead of going for rebounds, he started playing the backcourt. And he dominated. When we compete head-to-head as if our abilities are the same as others, we sometimes miss playing to our strengths. It’s like we tilt the playing field against ourselves. Instead, we need to focus on what makes us unique. Steve Jobs is one of the best examples of this in recent years. Apple played its own game and rose to dominance. What else could lead a person to run 153 miles through Greece? What else could lead an entrepreneur to do what the market believes is impossible? Balance is desirable, but it’s not the endgame. Finding and achieving your life’s purpose is. When we reach our goals, we need to take the appropriate time to celebrate. That’s a critical way to honor our work. But it’s also a key component of living a full life. Trade on your unique abilities, stay fueled by passion for your work, and take time to celebrate your accomplishments. Those three takeaways might serve an athlete. But I’m confident they’ll serve leaders even more. 1. Margin debt has increased 193% since the bull market began—the same as the rise from 2002 to 2007. Michael Belkin called the 2000 market top. Now the publisher of the Belkin Report, an institutional newsletter on asset allocation, and the Belkin Gold Stock Report is waving a warning flag about the level of margin debt on the New York Stock Exchange. There’s precedent for a high level of margin debt foreshadowing a market collapse. 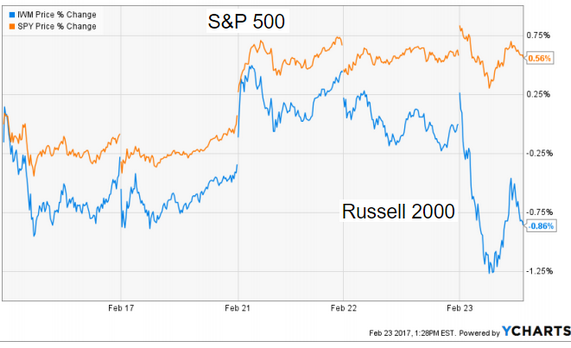 It peaked in March 2000, congruent with the market’s March 24 top and subsequent 49% decline. 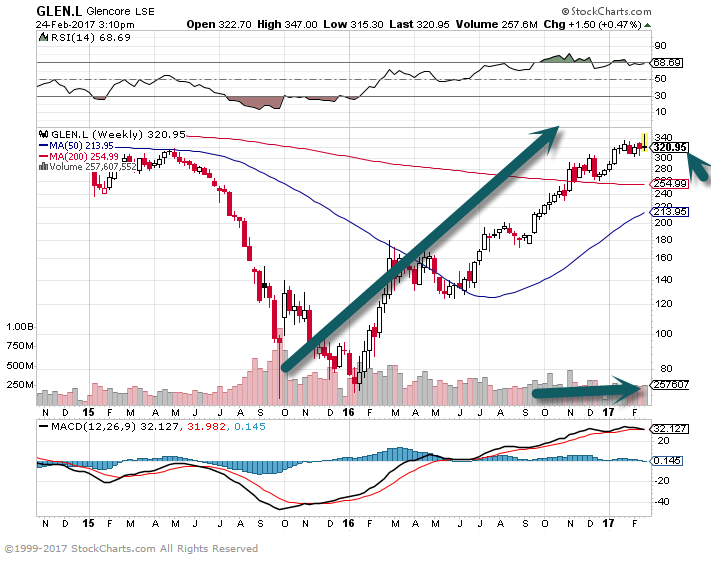 And it peaked again in July 2007, a few months before the market top in October. Another disturbing factor: The percentage rise in margin debt over the latest bull market is 193%, exactly the increase from 2002 to 2007, when the financial crisis began and the Standard & Poor’s 500 index later fell 57%. The problem with margin debt is that it causes a cascade effect. As the market falls, investors get margin calls on their loans and have to sell stocks to maintain their margin-debt minimum. Ed Yardeni, president of Yardeni Research, says, “As long as the market is going up, margin debt tends to go up as well.” And margin debt exacerbates a bear market. But Yardeni doesn’t know of any time when margin debt triggered a bear market. That’s a relief. 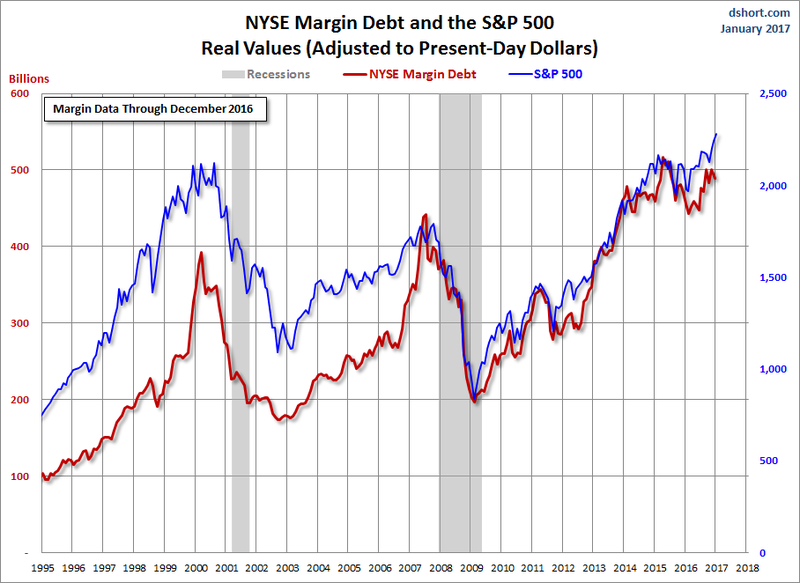 The NYSE has released new data for margin debt, now available through December. The latest debt level is down 2.2% month-over-month. The current level is 3.5% below its record high set in April 2015. The December data gives us an additional sense of investor behavior during the election rally. Is Money Moving Again to More Expensive Markets? It looks like investors are buying expensive markets and selling cheap markets again. In my August post “Gimme Shelter,” I pointed out that money was flowing into an expensive fixed income market and out of a reasonably priced equity market. At the time, I observed that recency bias and negativity bias were leading investors to shift money “under the mattress” into traditionally safe bonds or cash. I cited a Wall Street Journal article reporting that investor demand for bond funds relative to stocks was at the highest level on record. 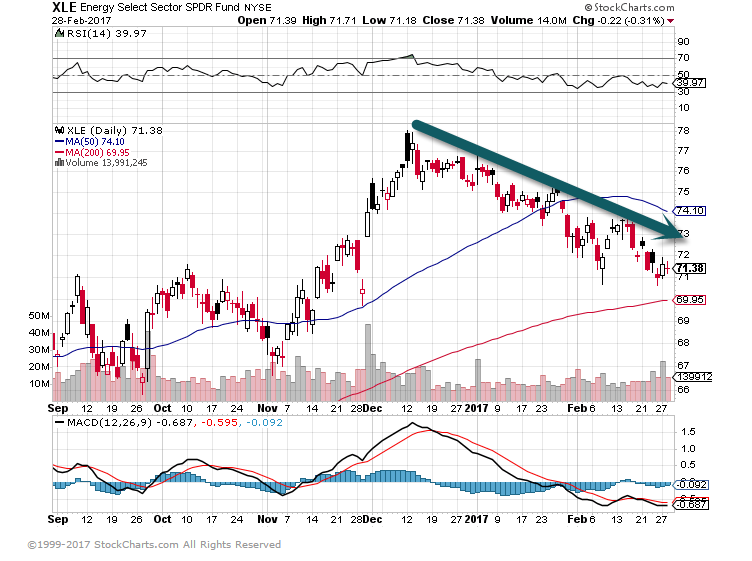 According to the article, investors had poured $202 billion into global bond funds and withdrawn $57 billion from stocks. In just the U.S., China and Japan alone, a stunning $55 trillion was sitting idle in bank deposit accounts that were yielding essentially zero interest. “Never before in history have individual investors been so bearish on stocks when the stock market is at a record high,” I wrote.